At the end of the Treaty of Sèvres concluded by the victorious powers with Greece and Turkey (traditonal rivals of the Balkans) the Turkish navy, allied with the Germans was to be reduced to a coastal force, a status far from past ambitions and glory, but true to current economical situation. 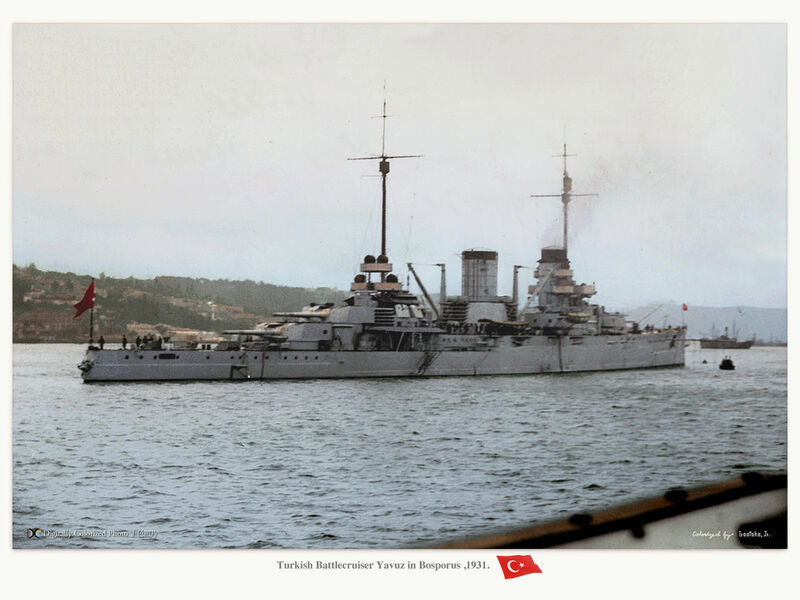 Above all, the allies demanded the return of the battle cruiser Yavuz Sultan Selim, the former German SMS Goeben taking refuge into Turkey in August 1914 and remained the last of the great modern German battleship after the Hochseeflotte scuttling in 1919. On one hand she was the best card in Ankara’s hand, but it was also seen as a threat to peace and naval balance in the region. Colorized photo of the Yavuz in 1945, by Hirotoko Jr.
With the attempted takeover of Mustapha Kemal, revivified Turkish nationalism provoked internal disturbances and a cooling in relations with Greece, going as far as the expulsion and deportation of Greeks living in Asia Minor, and mediatic sack of Smyrna. The civil war against the ruling dynasty dragged on until 1922, and by that time, the Turkish fleet was under the control of the Americans, British and French. In July 1922, peace was signed after the departure of the Sultan, authorizing the allies to negotiate a new treaty with the freshly installed government of Mustapha Kemal. Kemal was determined to keep the fleet, and his new position meant that he negotiated through tonnage reduction the destruction of obsolete units, but was still allowed to keep a small defensive naval force. 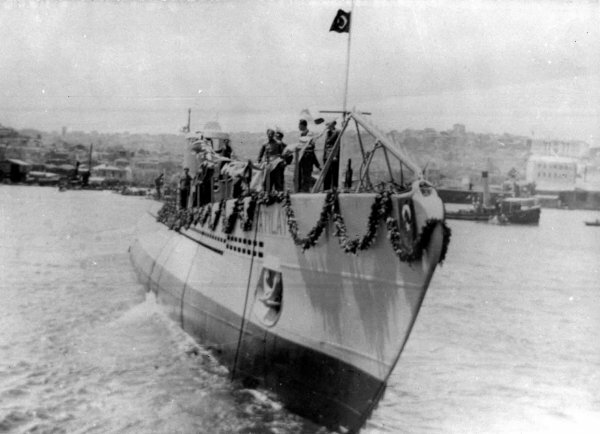 Above all, the Yavuz was preserved, becoming the mainstay of this new fleet. However the budget allocated was still very thin, and the program really began in 1926. The goal was to create a strong defensive force, able to block the Dardanelles with mines and submarines, but with a more active component, a task force made of the unique Yavuz as capital ship and four destroyers. It included the modernization of the oldest units, and the construction of two first submersibles. One of the key aspects for which Turkey was still courted by diplomatic cells, was its control over the straits, effectively locking the black sea. This was restricted by the 1923 Treaty of Lausanne, demilitarizing Turkey under the assumption that treaties under the League of Nations would keep the peace locally. But the failure of the latter soon trigerred a Turkish rearmament and some defiance towards the former entente power. These were the German-designed “N° 1” and “N °2”, built in Fijenoord, Holland. The new Turkish government indeed renewed its confidence to the old northern ally. After these, Turkey ordered five more, built in Spain or Turkey, and lately directly in Germany, before swapping when the war broke out, to the British. The Turks also trusted the Italians for destroyers, and the latter will deliver to them four destroyers and two additional submersibles, as well as MAS torped boats. In fact Fascism and Kemalism were both driven by an extreme nationalism and Mussolini regime had some strong influence over the new regime, whereas relations were tense at first. After all, not long before WW1, Turkey and Italy has been at war. The rapprochement followed the consolidation of the Kemalist regime was compounded by Italy’s attempt to build an alliance with Greece and Turkey to counterweight French influence in the Balkans from 1926 to 1931. However these attempt failed and relations became tense again until 1939. In 1936, Turkey called a conference in Montreux (Switzerland) to renegotiate the Treaty of Lausanne. The Montreux Convention established that non-littoral states were allowed restricted naval passage whereas Turkey was at least free to defend the straits in wartime or in the case of any impending threat. Soviet Russia could access the Mediterranean only with Turkey’s permission, wgiving the capitalist nations of the west some control over Soviet expansion. The British were contacted to provide patrol launches, supplying also destroyers (all requisitioned as well as submarines), released when possible from 1942 to 1945. By that time, more orders came, this time for HDML and Fairmile launches in relatively large quantities. In 1942-45, the British transferred some thirty light units indeed, hoping a Turkish engagement on the side of the Allies, even late into the war. These transfers took place under the personal insistence of Churchill, always aiming at the “soft belly of the Reich”. On the other hands, Turkish diplomatic relations with Berlin had strained since August 1944 and confrontation with the Greeks never happened. 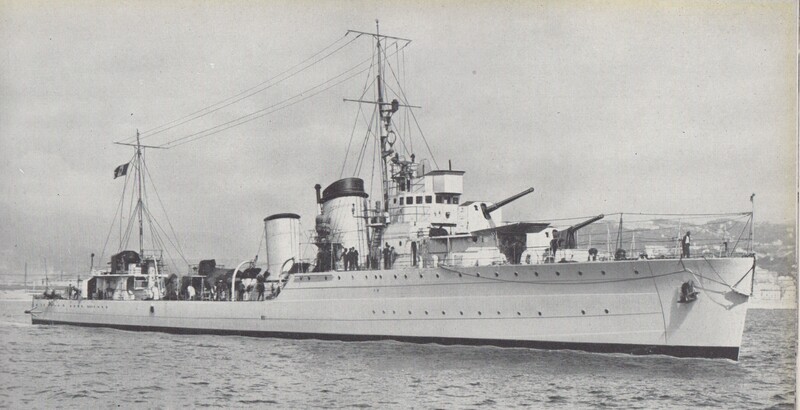 The mainstay of the Turkish fleet was obviously the formidable Yavuz, modernized in France in the 1930s, which despite its guns of a limited caliber retained great firepower, high speed and good protection. The very venerable battleship Torgud Reis, formerly Wissembourg, an ancient German pre-dreadnought of 1891, served as a coastal battleship, but he had reached the ultimate limit of his life span and had been classed as a mere pontoon since 1924. He had just to be demolished in 1938. The Hamidieh and Medjidieh, dating from 1903, were reportedly discarded by other fleets, but were retained as a training ship. They were perfectly operational as mine layers in case of conflict. Little homogeneity but a succession of classes of recent ships of Italian origin (Kocatepe and Tinaztepe). There were no others in service, the oldest being broken up in the 1930s. On the other hand an order of four destroyers was passed to Great Britain in 1939, copies of the “H” class. They were requisitioned before completion at the beginning of the war, and only two will be later attributed to Turkey in 1942, the other two being pressed into service with the RN: The two Sultanishar, followed in 1945 by the Muavenet, and the Gayret (as HMS Ithuriel) badly damaged in Bône in November 1942 during Operation Torch. In 1939, the Turkish fleet could count on a force of 9 submersibles, units of almost all-German origin, but officially Dutch (both Birindci), Spanish (Gür), and at last officially German for the three Atilay, the Batiray (requisitioned) before placing orders to Great Britain for four other S-classs in 1939 (Burac Reis class) requisitioned and retroceded with a British crew in 1942. One of them was saunk in action in 1943. The remainder third joined in the fleet by 1945. The Turkish Navy finally operated a panel of light units, including MAS torpedo launchers of the Dogan class, and Kavak MTBs of British origin and minelayers. In 1942 Turkey ordered and received ten more modern British torpedo launches, and towards the end of the war, in addition from the Royal Navy, seven HDML patrol boats and eight ML-type Fairmile launches in 1944-1945. However the fleet was also reinforced by three recent minelayers (Atak and the two Shivrishar class), and 8 older, the two (modernized) Berkistavets, the four Aidan Reis, the Nusret and the obsolete Intibah (1886). Turkey was part of the Balkan Entente (Romania, Yugoslavia, Greece, Turkey), neutral when France was invaded in 1940. In June 1941 with the German invasion of the Balkan Peninsula, a non-aggression pact was signed, giving Turkey a sense of security. On the other hand, this also secured the flank of the upcoming invasion of the Soviet Union for Germany. On 3 Nov 1941, the Turkish schooner Kaynakdere was sunk by Soviet submarine ShCh-214 in the Black Sea. The schooner indeed was spotted sailing in an area controlled by German troops and suspected smuggling in supplies. Other Turkish vessels were sank for the same reasons by Soviets. On the other hand, in July 1942 the Turkish merchant ship Antares was sank by error by the Italian submarine Alagi. Just prior to WW2, as the ituation in the Mediterranean was dire for the allies, both Churchill and Rooselevlt opened a seduction operation towards the Turks: In the first days of December 1941, Franklin D. Roosevelt announced the eligiblity of Turkey to receive Lend-Lease aid. Later with the capitulation of Italy and Germany’s more desperate defensive stance, Turkey started effectively a rapprochement to the Allied side. They halted chromite exports to Germany (a stainless steel component) in April 1944 and in August, severed diplomatic relations completely. In February 1945, Turkey attended the inaugural meeting of the United Nations and eventually declared war on Germany on 23 February 1945. This late entry would not have allowed the Turkish fleet any serious test. The German threat in the Black Sea or the Mediterranean was no longer relevant, although in the Black Sea, the Turks could operate against the remnants of the Romanian Navy under German control still operating. The Turks will not record any loss nor win however, being largely passive. But the move was to ensure a good treatmentwarmed qute quickly in the post-war environment, perhaps not anticipating the future east-west confrontation. 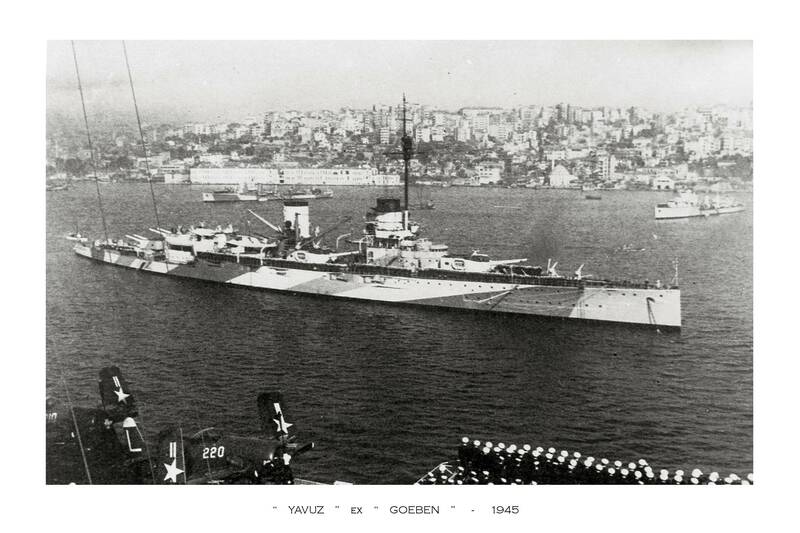 Certainly by far the most impressive ship of the Turkish Navy, the Yavuz, from her former name Yavuz Sultan Selim was formerly the Goeben of the Hochseeflotte, detached in 1914 in the Mediterranean squadron based in Port Said in Egypt. On the night of August 14, 1914, the telegraphist received from Germany the warning for imminent conflict. Admiral Souchon, awakened, did not wait for him to fall on allied ships in the harbor itself or a few miles to Alexandria, and had two ships, the Goeben, accompanied by the light cruiser Breslau. Souchon had only three alternatives, he chose the shortest escape route. Evading her pursuers, she managed to join Constantinople and to donate his two ships to the Turkish authorities, who accepted them. Indeed the Turkish admiralty knew all too well to be singularly ill-equipped to support a naval conflict against Italy, Greece and Russia. The close ties which the German empire cultivated with the Ottoman Empire greatly assisted this action, which provoked an allied consternation. The sublime door, as a belligerent, allowed Souchon to wear the traditional red fez and continue to lead his German crew almost independantly until the end of the war, as wel as having a say on all the admiralty’s planning. The Goeben, henceforth, Yavuz Sultan Selim, as well as the Breslau, thus led several actions in the Black Sea. The firepower and qualities of the Yavuz made her a formidable adversary and a master asset in this area for the triple deal. The Breslau was destroyed in battle, the Yavuz was immobilized at the end of the war in Constantinople and waited for his fate. For the allies who were not fooled by his flag or his name, the Yavuz was to be interned like the rest of the Hochseeflotte, once his crew returned to Germany. Negotiations went well, the Turks having done everything to preserve this building. Unofficially, no doubt, against territorial compensation, and no doubt also because the allies thought that Turkey would be unable to maintain it properly, the sublime door was allowed to keep its flagship. De facto, after the wreck of the fleet at Scapa Flow in 1919, and the scrapping of shipwrecks in the 1920s, the Yavuz became effectively the only battle cruiser of the great navy of William II still afloat. He was the only one in the world to be part of this very exclusive club also including the Hood and the Repulse, as well as the British Renown. 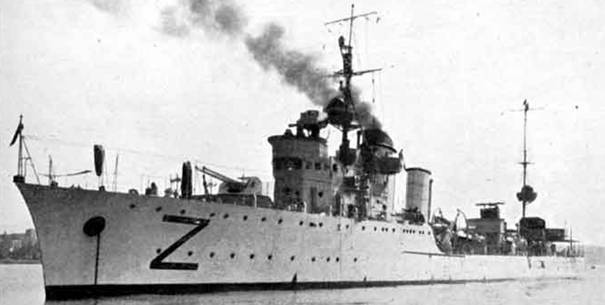 In 1927, she was sent to Izmid with modern fire control equipment from Seyne-Penhoet Yards. The machines were upgraded to oil-firing, and the Yavuz was capable of 27 knots at tests. In 1936, its appearance changed little, if not in details, the Yavuz Sultan Selim simply became Yavuz. In 1938, a new and very partial modernization took shape, cosmetic, and in 1941 the greatest changes took place: Its rear mast was removed for reasons of stability because at the same time its anti-aircraft batteries were brought to 12 pieces of 40 mm and 4 of 20 mm. He was camouflaged, but Turkey remained neutral and the Yavuz was quite inactive. In 1945, when Turkey finally officially went to war with the allies, the Yavuz made some operational sorties, having for it its speed and its batteries of 280 mm pieces whose reach was very weak. 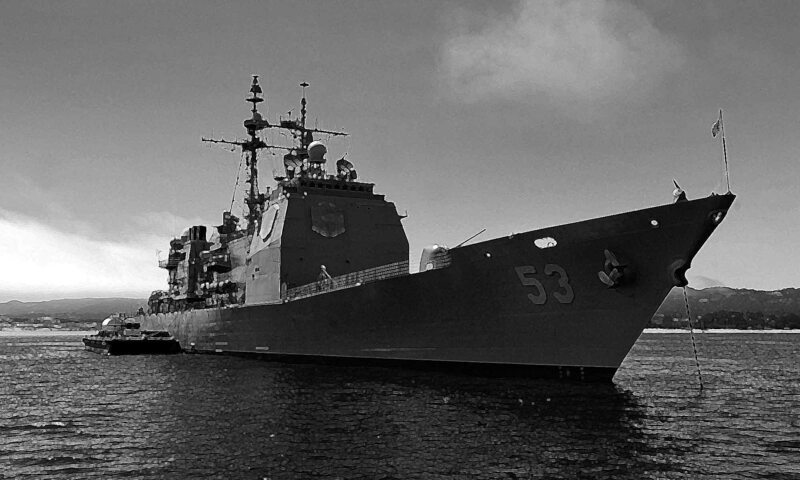 She would remained in service again during the cold war until 1971. (It was a training ship and the pride of the Turkish navy for thirty years). At that date, it was decided to scrap him, a decision which in retrospect was unfortunate: Preserved, the Yavuz would have been the last witness of the great kaiser’s navy. Of course this is only an introduction to the Yavuz. On the long run, a complete post would be made of her. -Propulsion: 2 shafts Parsons turbines, 35,000 hp. and 27 knots max. -Weaponry: 12 guns of 280 mm, 12 guns of 120, 12 guns of 40 mm Bofors AA, 4 of 20 mm AA, 4 TLT 533 mm SM. Medjidieh and Hamidieh, although classified as different ships, were very close. Designed on British plans and built elsewhere in Britain, they were perfect examples of export cruisers bearing the brink of Armstrong-Eltswick shipyards. At that time, they were still the pride of a navy formerly powerful and which counted mainly in its ranks that ancient battleships of the nineteenth century reconverted into floating batteries. 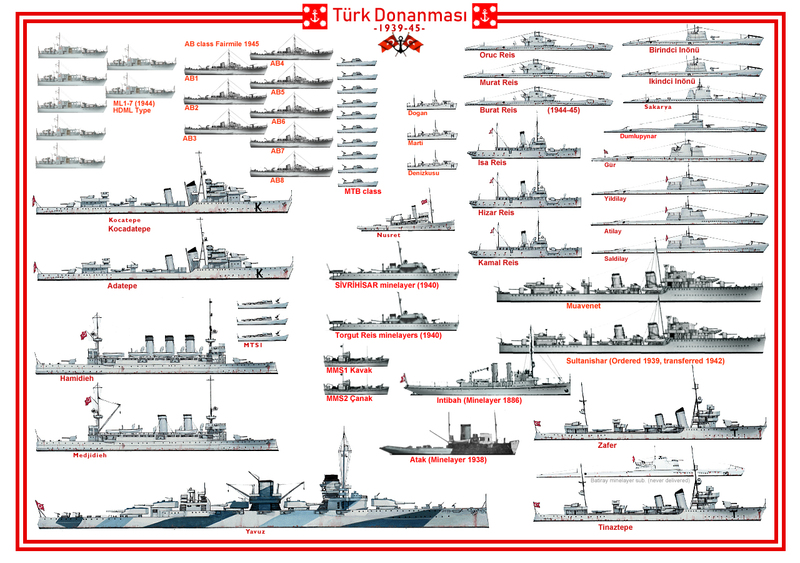 Painted in khaki green, the livery of the Turkish ships in 1914, they participated in various operations in the Black Sea, but did not intervene against the fleet allied to the Dardanelles. -Propulsion: 2 shaft Parsons turbines, 35,000 hp. and 36 Knots max. -Armament: 4 x 120 mm, 2 x 40 mm Bofors AA, 2 x 20 mm AA, 6 x 533 mm TTs. Built in Genoa (Ansaldo), these two units (Adatepe and Kocatepe) were generally inspired by Italian standard destroyers, but with four simple turrets instead of doubles, requiring dedicated deckhouses and lengthening the length of these ships, and two fireplaces. instead of a. For the rest, they were fast, flawless marine vessels. They participated in some patrols in 1945 and continued their service until about 1955. Propulsion: 2 shafts Thornycroft turbines, 40,000 hp, 16 knots. Armament: 4 x 120 mm, 2 x 40 mm Bofors AA, 2 x 20 mm AA, 6 x 533 mm TTs. The Tinaztepe and the Zafer were built at the Riva shipyard in Trigoso in addition to the Kocatepe. They were inspired directly by Freccia’s plans, but their chimney ducts emerged separately. They could also anchor mines and had a less active career, apart from a few sorties in 1945 in a Mediterranean furrowed by Allied ships. They were scrapped in 1957. Propulsion: 2 shaftsParsons turbines, 35,000 hp. 36 knots max. Translated as “Number 1 and 2”, the Birindci and Ikindci were submersibles studied by the Germans at the Hague office (and built in Fijenoord). These were buildings inspired by the UB of 1917, much improved. Designed in 1925, they were delivered in 1927. Oceanic, powerful, they plunged up to 150 meters and spun 8.5 knots under water. They will be demolished in 1955-56. Propulsion: 2 shafts 2 MAN diesels, 1100/700 hp. surf./sub 13,5/8,5 knots. Armament: 1 x 75 mm gun, 1 x 20 mm AA, 6 x 450 mm (4 bow, 2 stern) TTs. Other Submersible built in Italy but inspired this time from the Argonauta. It was a coastal, and also equipped with German diesels. She was remarkably fast in diving (10 knots on trials). Propulsion: 2 shafts MAN diesels, 1600/1100 hp. surf./sub. and 16.9/9.5 knots. Armament: 1 x 100 mm, 1 x 20 mm AA, 6 x 450 mm TTs (4 bow, 2 stern). The Gür was a submersible studied by the Germans for the Spaniards. It was built in Echovarietta Y Larringa in the Basque country, but the Spanish sold it in 1934 to Turkey. it was the brilliant draft of U-Bootes type IA. Oceanic, these units boarded 14 torpedoes and spun 20 knots on the surface, and relied on 6400 nautical, which made it a perfect raider. He will be disarmed in 1957. Propulsion: 2 shaft diesels MAN, 3800/1000 hp, surf./sub. 20/9 knots. Armament: 1 x 100 mm, 1 x 20 mm AA, 6 x 533 mm TTs (4 bow, 2 stern). The Gür having impressed the Turks, they directly ordered three other units to Germaniawerft German shipyards in Kiel, which at the time no longer moved anyone: The Anglo-German naval agreement had definitively buried the prohibitions resulting from the treaty from Versailles. The Yildilay was however built in Istanbul. The other two, Atilay and Saldilay, were issued in 1939. They were derived from U-Bootes type IXA, but had their cannon under shield. They plunged more than 100 m operationally, but their strength allowed them to go down more than 200 meters and withstand the pressure. The Atilay was lost in 1942, not in combat but in exercises: He sank with all his crew. The other two were scrapped in 1957. The Batiray was a great minelayer submersible ordered from Germaniawerft, Kiel. It was never delivered to the Turks, the Germans requisitioned her in September 1939 just after completion. The minelayr submersible was renamed AU and operated in the Baltic and Norway until 1945 under German flag. She was scuttled to avoid capture on May 3, 1945. Propulsion: 2 shafts 2 diesels B & W, 3500/1000 hp. surf./sub. 20/9 knots. Armament: 1 x 100 mm, 1 x 20 mm AA, 4 x 533 mm TTs (4 bow), 20 mines. The Turks ordered four Submarines to British yards (presumably to give the change after having largely ordered to the axis, Italy and Germany, and to prove its neutrality). They were of famous “S” type. The class comprised the Burac, Murat, Oruc and Ulac Ali (Reis), laid down at Vickers-Armstrong before the war. They were all requisitioned in 1939 by the Royal Navy. The Turks waited until 1942 to see the return of the first two of this initial order, the Oruc and Murat, ex-P 612 and 611 and the third, Burat Reis in 1945, manned by British crews. They will be disarmed in 1957. P615 (ex. Oruc Reis) was sunk by U-123 in the Atlantic in August 1943. Propulsion: 2 shaft Vickers diesels, 1550/1300 hp. surf./sub. and 13.75/10 knots. Armament: 1 x 76 mm, 1 x 20 mm AA, 5 x 533 mm TTs (4 bow, 1 stern). 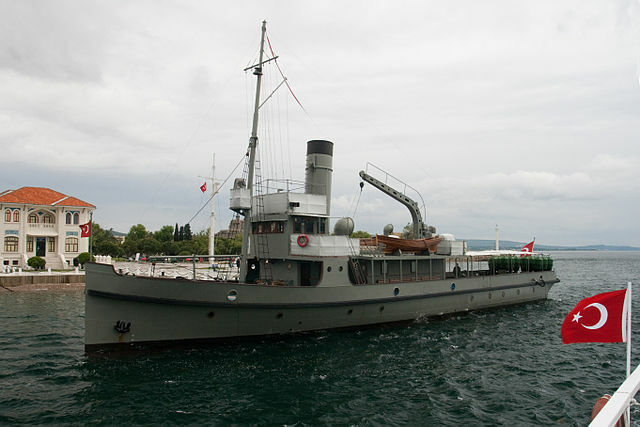 Three units built in 1911-12 whuich served as gunboats in 1914-18, and were converted in 1938 into minesweepers (Hizar Reis, Isa Reis and Kemal Reis). They operated until 1947-48. Other comparable gunboats had been scrapped in 1925-26, the Burak, Sakiz and Prevezah. Their sister ship of 1912, the Aiden Reis had been transformed into a fishery guardship. Propulsion: 2 propellers, 2 Parsons turbines, 35,000 hp. and 36 Nodes max. Nusret (1912) and Intibah (1886) were high-sea tugboats converted to minelayers. They made both world wars and were scrapped in 1957. Intibah had a very long career since she was rebuilt as a minelayer later (she was also much larger than the Nusret (616 tons)). She was renamed Uyanik in 1942 and finally broken up in 1957. Additionally the fleet was completed by SS Kiresund, an old civilian freighter of 3056 GRT (1877) converted and in service during the Great War but scrapped in 1927. More modern was the Atak (1938), built at Gölcük, a 500 tons ship, 43.99 m long (144 feets), with a 1025 hp VTE, 13 knots, carrying 40 mines, and the Sivrihisar class (1940) built at Thornycroft (& Torgud Reis), 350 tons, 52.45 m long (172 feets), 1200 bhp and 15 knots, 40 mines and a QF 75 mm gun (3 in). The Kaptan Nusret (lost 1989) was salvaged in 2002 and restoration ended in 2008. The Nusret was the most famous Turkish minelayer. Originally a German tug, purchased before the war. She was converted during WW1 and famously operated during the Gallipoli Campaign. During the early naval phase when the combined French-British fleet bombarded the inner forts of the Dardanelles, the Turks observed the path taken by the battleships and the Nusret sailed to the area by night to lay mines just at the tight spot. The following day, the battleships were back. The small Nusret’s mines would make a carnage on the old pre-dreadnoughts, with limited ASW protection. The Turkish ship claimed that day the battleships HMS Irresistible, HMS Ocean and Bouvet, and sending the Battlecruiser HMS Inflexible crippled in a dockyard for almost a year. The loss were so horrendous (until then the combined fleet did well against the forts) that the allied Admiral decided to draw a close to the naval operation, trigerring the landings, with the results we know. The Nusret (Or Nusrat) was renamed Yardım in 1937 used as a diving vessel, and Nusrat again in 1939 as a tender, then Kaptan Nusret in 1966 until she sank in April 1989 off Mersin Harbour. She layed at the bottom for ten years before being salvaged and overhauled, restored in her 1915 appearance and now in the çanakkale museum. Armament: 4 guns of 120 mm, 2 guns of 40 mm Bofors AA, 2 of 20 mm AA, 6 TLT 533 mm. Capable MTBs in service in the Turkish Navy were the three Dogan class boats, MAS types, bought from the Italians in 1931 and built by SVAN yard. In the old fashioned way, they had a slightly raised prow and two torpedoes launching from the stern with compressed air, 450mm aviation torpedoes. They also had a shielded 75 mm QF gun, and 8 ASW grenades. These 32-tonnes ships could reach 34 knots, thanks to their two powerful Isotta Fraschini engines delivering 1500 hp total. The class consisted of Dogan, Marti and Denizkuzu. They were removed from the lists in 1947-48. The two Kavak (Kavak, Canak) were of the HDML type (diesel patrol boats) ordered from Thornycroft and issued in 1939. These ships were capable of 15 knots but were not equipped with any weapons and only used for patrol. The 10 Thornycroft MTB type (MTB-1-9), built in Turkey on plans by Thornycroft arrived in 1942. The latter barely deserve the title of launches, since they only reached 10 knots. These 70-ton vessels had a combined 2000 hp and were armed with two 533 mm torpedo tubes, proper size antiship torpedoes. In addition, the Turkish Navy took delivery in 1944 of seven HDML types renamed ML1-7 and in 1945 of eight Fairmile Motor Launches (AB1-8), used until the 1960s.